The iA (Intelligent Auto) mode lets users leave everything to the camera to take beautiful images with its Optical Image Stabilizer, Face Detection, Intelligent Scene Selector and Intelligent Exposure. Once you enter the iA mode, these multi-capable functions occur automatically, so that you can shoot without adjusting settings should conditions change. DMC-LZ30 is also capable of recording HD video in 720p. The popular Creative Control and Creative Retouch are newly available with a total of 10 (Creative Control) / 11 (Creative Retouch) attracting filter effects. Panorama Shot and HDR(High Dynamic Range) are also incorporated in DMC-LZ30. The 3.0-inch large 460,000-dot LCD assures high visibility in any lighting circumstances, which is excellent for both shooting and playing back images. Its ergonomic design offers stable, comfortable grip even after holding a camera an extended time. 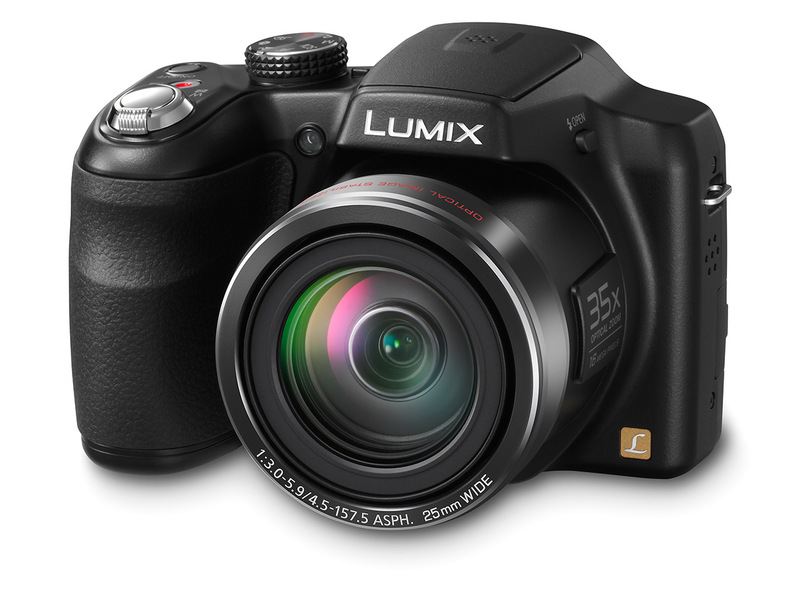 The DMC-LZ30 features 25 mm wide angle lens with a 35x optical zoom (35mm camera equivalent: 25-875 mm). Comprising of 14 elements in 10 groups including 3 ED (Extra-low Dispersion) lens and 1 dual-sided aspherical lens, this advanced lens unit realizes the outstandingly compact body. The Extra Optical Zoom function that extends zoom power to 78.8x (at 3-megapixel resolution) by using the center part of the 16.1-megapixel high resolution CCD to bring subjects even closer. Not only drawing near the subject distant away with its powerful optical zoom, the 25 mm ultra wide angle lens captures wider angle of view compared with a standard 35mm camera. It is helpful for shooting dynamic landscape or indoor group portrait. The blurring of an image due to hand shake occurs often when using a high zoom, however, the Optical Image Stabilizer minimizes it without causing deterioration of image quality. Linking smoothly with the 16.1-megapixel high resolution CCD sensor, the image processor reproduces high quality image even in high sensitivity recording at ISO 1600 and max. ISO 6400 with High Sensitivity mode. Panasonic incorporated the Intelligent Auto mode in pursuit of the ultimate ease of operation and the reduction of missed shots. The mode is a comprehensive integration of Optical Image Stabilizer, Face Detection, Intelligent Scene Selector and Intelligent Exposure – the camera does all the work, leaving you free to compose shots, aim and shoot the subject. The Face Detection sets appropriate AF/AE on the face of people while removing the unwanted red-eye. The Intelligent Exposure corrects the brightness in parts of the image that are too dark due to insufficient lighting, backlighting or use of the flash. The Intelligent Scene Selector automatically selects the 6 Scene modes – Macro, Portrait, Scenery, Night Portrait, Night Scenery and Sunset – that yields the best shooting situation. While offering a convenient shooting-assist function such as iA, DMC-LZ30 is equipped with P / M mode for users that are more advanced to enjoy more creative photography. The DMC-LZ30 records dynamic HD video in 1280 x 720p in Motion JPEG. Recording motion image can be started with a press of an independent motion picture button on the top of the camera, which is extremely convenient for users to switch photo/video shooting instantly. Zooming is also available to draw subjects far away. Users can also sort and archive the images via a bundled software PHOTOfunSTUDIO Ver. 9.0 LE and upload them to the social networking services like Facebook™ or YouTube™. • Use a media card with SD Speed Class* with “Class 6” or higher when recording motion pictures. * Motion pictures can be recorded continuously up to 2 GB. The maximum available recording time for up to 2 GB only is displayed on the screen. The DMC-LZ30 newly integrates popular Creative Control and Creative Retouch. The Creative Control lets users shoot with a filter effect (Expressive, Retro, Low Key, High Key, Sepia, Dynamic Monochrome, Impressive Art, High Dynamic, Cross Process and One Point Color) while checking how it makes difference on the picture, which can be used for video recording, too*. The Creative Retouch enables applying a filter effect (Retro, Low Key, High Key, Sepia, Dynamic Monochrome, Impressive Art, High Dynamic, Toy Effect, Miniature Effect, Star Filter and One Point Color) on the picture after shooting in camera. The Panorama Shot makes it possible to shoot a horizontal / vertical panoramic image with consequent shots taken by overlaying the previous picture. With the new HDR(High Dynamic Range) mode, several photos are consecutively shot at different exposure level to make a single composite picture without whiteout (over-exposure) or blackout (under-exposure) even in difficult lighting conditions. * Impressive Art cannot be used for video recording.